Pork shoulder is suited to slow cooking and will be melt-in-the-mouth tender given time. The cider braising liquid, lightly pickled leeks and punchy horseradish make this a surprisingly clean and bright dish. Serve with potatoes or pearled rye or spelt. Season pork all over with salt and pepper. Melt butter in a casserole just big enough to fit the pork. Brown the pork for two to three minutes on all sides over moderate heat. Add onion and bacon and continue cooking, stirring, for five minutes. Add cider, herbs and dark green leaves from the leeks. Bring to a boil and then immediately reduce the heat to low, cover and simmer for two or three hours until the meat is very tender. If the liquid doesn’t cover the pork, you need to turn the meat over every half hour. Remove the pork and bacon pieces and sieve the sauce. Pour the strained sauce back into the pot and reduce over high heat until there is about 500ml left. Adjust the flavor with salt, pepper and a few tablespoons of apple cider vinegar, as desired. Meanwhile cut or pull the meat into serving-sized pieces and prepare the garnishes. To serve, return the meat to the sauce and reheat gently. For the pickled leeks: Cut the white and pale green section of the leeks into thin slices on a sharp angle. Soak in cold water so that any trapped dirt falls out. Lift out into a colander to drain and then toss with vinegar and salt and leave to pickle for half an hour. For the horseradish: Whisk the crème fraîche with an electric beater until light and fluffy, like whipped cream. Fold in the grated horseradish to taste and serve immediately before the foam collapses. Serve the meat and sauce over a bed of potatoes or boiled grains, topped with the pickled leeks and horseradish cream. A sprinkling of crispy bacon pieces is also very nice! © Copyright 2013 Anna Colquhoun. 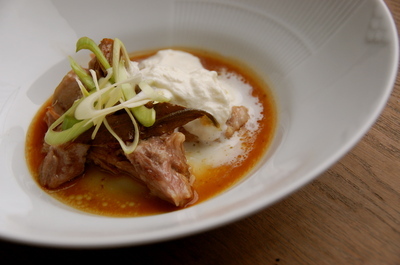 Listed below are links to blogs that reference this entry: Cider-braised pork with pickled leeks and horseradish.